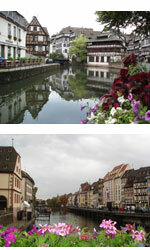 Alsace is a country in France, with its style and strong character that will make it a memorable stay. Trip 2 visit. Com has made you turn to Strasbourg and then to Hochkönigsburg, mythical places of Alsace. Scenery and charm guaranteed. The city of Strasbourg French offers the visitor a feeling of strange ... clean! But beyond the cliché verified, Strasbourg is a city particularly elegant in rich cultural heritage. Downtown Srasbourg, the Big Island is classified as a World Heritage of Humanity by UNESCO. Stroll in the historical center of Strasbourg, to discover small spaces, facades of the Middle Ages, and of course the magnificent cathedral of brick red. Prohibited for you not to explore on foot Petite France, the unmissable old fishing area. Ill which irrigates Strasbourg is a tributary of the Rhine and count to 5 arms in the area of Petite France. Other city of Alsace which deserves a look: Colmar, particular with regard to his little Venice - and its historic center - architectural cousin of Petite France. Everything south of the plain of Alsace, you will come to Mulhouse. Before leaving Alsace, a short detour by Hochkönigsburg and the Alsatian vineyards will complete your stay. The Haut Koenigsbourg appears in the distance like a castle of fairy tale: from the North, its forms beautifully complement the Vosges conical hill on which he settled. The castle was restored by a patron German. If you go to Top Koenisbourg, you can not escape the wine trail of Alsace. The Alsatian grape varieties are located in foothills of the Vosges, on the eastern flank of the massif and along the plain of Alsace. AOC 3 are operated varietals Riesling, Muscat d'Alsace, Pinot Blanc, Pinot Gris, Pinot Black, Sylvaner and Gewurztraminer. The Alsace wine region extends over a distance of 170km from Marlenheim in Thann. Add to bookmark this page France " Visiting Alsace " - Firefox do "Ctrl D"